The Book Chook loves books. The Book Chook loves technology. Now we have books in a digital format AND books in print. What's a chook to choose? Answer: Both! I think there are times when a digital story is the perfect answer. And there will never, ever be anything as special as holding and reading a good print book for me. Luckily, we don't have to choose one format or the other. We get to enjoy both. Today on The Book Chook blog, I'm pleased to welcome Lynette Mattke. Lynette is the founder of PicPocketBooks. A former stay-at-home mom now turned mompreneur, Lynette studied English Literature at Haverford College where she met her future husband and business partner, Manuel Mattke. Lynette trained to be an elementary school teacher and brings years of experience as a homeschooling mom of three children, as well as a deep passion for children’s literature and early literacy, to the high publishing standards of PicPocket Books. You can see sample PicPocket books on the web site, and catch a video of two children reading one on Keeps Me Smiling blog. If you'd like the chance to try a PicPocketBook on your own iPhone, scroll down to the Giveaway below. I asked Lynette some questions about PicPocketBooks. Lynette, you've created an app for iPhones called PicPocketBooks. Can you tell us about it? 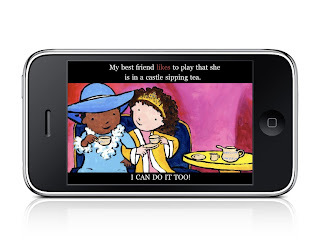 PicPocket Books offers picture books for kids as downloadable iPhone/ iPod touch apps. Children from 2 - 8 can now enjoy their favorite stories on the go—at the doctor’s office, at the store, on the airplane; any situation where it's impractical to bring physical books along. PicPocket Books offer a new and unique experience, combining the beauty and distinctive quality of picture books with professionally produced audio narrations and interactive visual text. I guess some people complain to you that their kids already get lots of screen time. What do you say to them? Why do kids get a lot of screen time? Because they are really drawn to this kind of media. The technologies that are new to us are very intuitive to them and will be a significant part of their lives for years to come. I think it's important to introduce our children to quality and age-appropriate content on the screen, whether we're talking mobile digital technology, desktop computers or other media. I don’t see PicPocket Books as replacements for print books or the valuable time parents can spend reading to their children, but as educational and culturally valuable alternatives to video games or movies, especially for families on-the-go. Reading a story book on a screen is also a very different experience from playing a repetitive video game on the same screen. It has the same educational, mind-opening benefits as reading a traditional print book: increases vocabulary, improves concentration and focus, and expands horizons. How does PicPocketBooks help children toward literacy? First of all, most kids are very curious about electronic gadgets. Why not capitalize on that fascination to grab their initial interest? Whether we're talking print or digital books, reading is an active mental process: something to encourage at every opportunity. Our apps offer a "learn-to-read" feature where the text is highlighted as the word is spoken, encouraging the connection between the written and spoken word for emergent readers. Your smartphone is something you'll always have on you when stuck in a line or other unexpected wait. Use that time to share a picture book with your child, and let the story spark a conversation. Many families are short on time and e-books can be read any time, any place. I believe that if reading picture books on the iPhone means that more families are reading together and that more kids have more exposure to storybooks, then they are a great option for the tech-savvy families of today. What exactly happens once I've downloaded my PicPocket book to iTunes? How does my child get to read it? You can download a PicPocket Book app just like you'd download a song from iTunes on your iPod. Just download the app once and play it as many times as you like. How can you fit a book page on a tiny little screen? Even though the iPhone is small, it has great resolution and a back-lit screen. Even detailed pictures come through very sharp and clear. PicPocketBooks is not the only picture book app for iPhone. What makes it better? PicPocket Books has the largest selection of picture books for the iPhone. We offer a wide range of classic content from established publishers, including previously published "board books", concept books, easy readers, fairy tales, and other culturally diverse picture books. We produce our titles through an artistic process and our apps remain faithful in content to the original books. The full color illustrations are detailed and clear. The text is easily readable and we offer a "learn-to-read" feature where the text is highlighted as the word is spoken, encouraging the connection between the written and spoken word for emergent readers. Giveaway: Lynette has kindly offered to give each of 5 lucky Book Chook readers their choice of a PicPocket book. Send me an email (under my blog header) to register your interest, and don't forget to mention which title you'd like by checking out the range on PicPockets website. I will ask a random chicken to choose 5 winners. Note: you must have an iPhone or iPod touch to use PicPocket Books.